I've been avoiding his review for the better part of a month because, with all the hype the Envy line has gotten (some deserved), I took the Envy 15 out of the box and had one thought: "Cheap." In brief, the Envy is a indeed light system with plenty of power, but it never feels premium, nor does the battery life reach adequate levels. Sure, it comes in a nice black box labelled "ENVY" with properly monolithic upscalism. And the computer itself is wrapped in a very, very soft black cloth. But once removed, I can't distinguish this $US1,800 laptop from any random PC on a table at Best Buy. 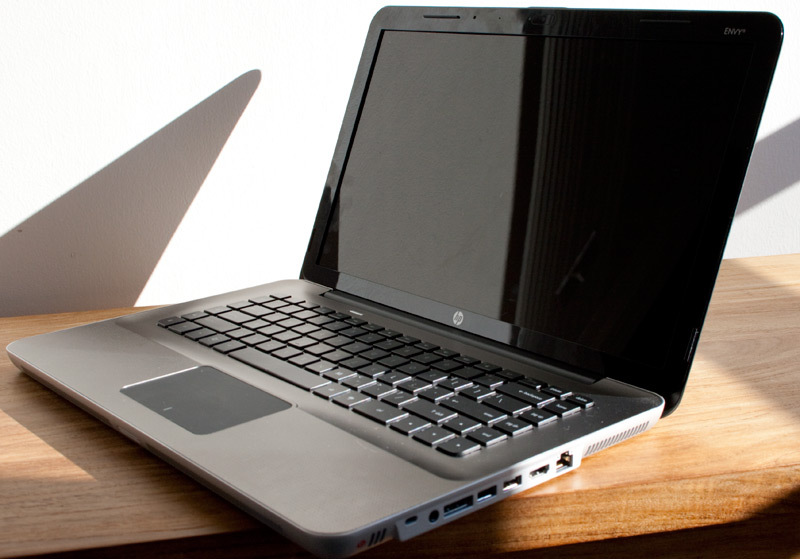 HP's premium laptop, one that's been oooh'd and ahhh'd ad nauseam, could have been a $US600 budget laptop. The aluminium magnesium body, which works well enough in the 13-inch Envy, scales to become a big, synthetic-feeling disappointment. Yes, it's just an inch thick and 2.4kg (about 500g lighter than peers), but the footprint is so large that, upon opening the packaging, I at first believed HP had sent me a 17-inch system (keep in mind, there's still no room for an internal optical drive). It was a surprising thought, but at that moment, I realised something: HP is the new Dell. Disregarding their impressive TouchSmart desktops, HP has built the quintessential drab PC laptop and labelled it as "designer." Meanwhile, Dell, with their fashion-forward Adamo line, has left rivals like HP somewhere back in 1995. I almost hate to continue describing the system, lest I beat a dead horse. The keyboard is adequate, but every impact reverberates through your finger, making the laptop feel more fragile than it probably is. The trackpad, despite multitouch promises, is dreadful to use. Two-finger scrolling is met with a perpetual half-second (or greater) delay, and clicking the buttonless pad (engineered much like a MacBook Pro pad) screams unfinished prototype. There's simply nothing elegant about the mechanics, even though the 1920x1080 screen is indeed sharp, HDMI and eSATA connections are convenient and the Beats-branded speakers are very balanced and rich...for laptop speakers. Performance But my hate-fest for the Envy ends there. If you don't mind the aesthetics and feel—and at this price, you really should—the system won't disappoint. The 1.6GHz Core i7, coupled with 6GB of RAM, 500GB 7200RPM HDD, and ATI Mobility Radeon 4830 (with 1GB RAM) has gotten performance nods from around the web. While the system can't best 20fps in the higher tiers of Crysis, it can reach 32fps if you scale the graphics down to 1024x768, according to Notebookcheck. Older and less insane titles perform even better. PCMag's cross-laptop testing found that the Envy isn't the fastest laptop out there, but it keeps pace with other Core i7 systems to the point that such a distinction doesn't really matter. And it'll shame Core2Duo systems, like the aging MacBook Pro. In real world use, the speed is a pleasure, and a welcome level of overkill for mediacentric web browsing in an era when Atoms are chugging to just get the job done. But all this performance comes at a heavy, heavy price. You should only expect the Envy to get a measly 1 hour, 20 minutes of battery life*. Given this system's sizable footprint, it needs to last more than 2 hours under moderate use. Stick a bigger battery in there, HP. Something. Please. Misguided Envy Some of you will be fooled by the light body covered in laser-etched paisley—probably the same among you who can drink instant coffee, listen in 92kbps MP3s and think that SD broadcasts look identical to Blu-ray movies. And that's fine. I can understand why someone might like the Envy, especially given the processing power and modest 2.3kg weight. It's just a shame that anyone would pay so much for it. HP, Acer, Toshiba, etc, you think I like giving Apple all my money? There's a staggering amount of design talent in the world. Find it. Fund it. And give it a chance to wipe the smug grin off Cupertino. Offer us all something that we should really be envying. Engineers observed bubbles of sand moving within other sand, like oil droplets through water, in a first-of-its-kind observation.